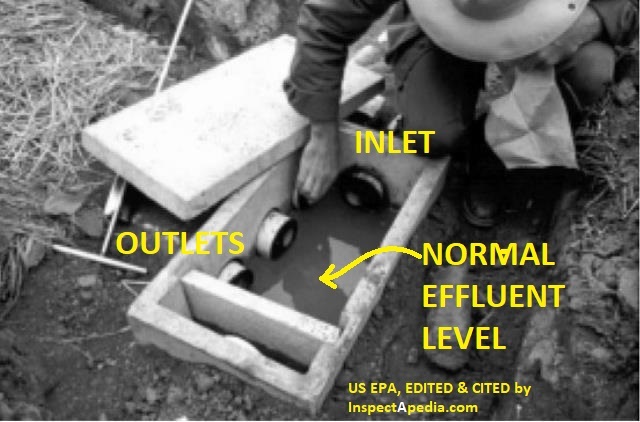 This article explains the causes & suggests cures for effluent leaks, odors, or smells at the septic distribution box. If the D-box is leaking, smells, or is tipped, clogged, or otherwise not working this article describes how to diagnose & fix the trouble. Reader Question: water is leaking out of my distribution box. Should the lid be sealed? If you see "water" leaking out of the septic drainfield D-box it's a sign of trouble. I suspect one of two typical causes. The soils around the septic field may be saturated with groundwater, flooding the drainfield and backing up and out through the D-box cover. Just sealing the cover wouldn't fix anything in this case. You'd need to divert groundwater away from the drainfield. The septic drainfield or leaching beds may be saturated from having become clogged - at end of life. If this is the case the backup of effluent is occurring because the soil is no longer absorbing effluent. You'll need to investigate to decide if the problem is a blocked or damaged or clogged drainfield line or if the whole field needs replacement. You don't want surface or ground water leaking into the D-box since in any quantity that water will flood the drainfield. If the D-box cover fits pretty flush and smooth atop the distribution box, the amount of water that leaks in through the top should be trivial. If the top is quite uneven and leaky, and if you can't correct surface drainage to keep water away from the distribution box you might need to add a compressible rubber or foam gasket between the D-box lid and the edges of the distribution box itself to reduce leaks there. Don't cement the distribution box lid in place or you won't be able to open it for inspection, adjustment, or repair. New septic put in 6 years ago. I have a pump chamber after my septic tanks (twin 750 gals), the chamber pump (100 or 150 gal ) kicks on when the level gets high enough. The grey water is pumped to my d- box about 25 feet. The d box has 2 outflow pipes leading to a leach field with baffles etc. The d box seems level and the problem is no matter what we have used to keep the cover on the box ( a piece of blue stone 1 " thick as it sits in the middle of a brick patio ) the d box leaks. Again on the 4th of July with 12 -15 folks over ( part of my problem???) , I heard the pump chamber kick on, 15 seconds later could smell it and then about 3 to 5 ounces of water came out. The leaks came from the corners opposite the inflow. I can't get it to stop leaking, every time the pump chamber kicks on. This is the 3 time in 6 years that I am faced with a dbox with a cover ( modified cover since its blue stone ) that leaks. If we cement the blue stone onto the d box how can this keep happening? You could convert to a more-easily sealed D-box but I don't think that's the problem. I suspect that the D-box is too small AND that with the small size, the effluent (it's not graywater) is not being accepted into the drainfield rapidly-enough. The result is the pump is filling the D-box faster than its outflow rate, causing backup and odor complaints. A much larger D-box, sufficient to receive and then drain by gravity into the drainfields the whole pump cycle volume would be one approach that may tempt you but I don't recommend it. 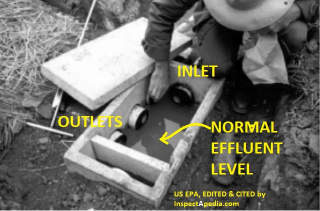 Rather, you need to look at the inflow capacity of the drainfield - it may be that the drainfield is under-sized, or worse, that it is poorly designed / installed and is flooding, or possibly the line balancing openings in the D-box that balance flow into different drainfield lines are too small. If the D-box overflows only at the very end of the pump cycle you could see if your pumping system rate can be adjusted to send effluent to the D-box more slowly. Reader Question: Clogged D-box Repair Procedures? I removed the roots but I could not remove the seal from the box. It has 5 more holes in it which 4 are closed and the other has a pipe leading to another concrete box 4-5 feet further out. The second box is much deeper than the first. It appears that the pipes T out after the first box. More digging tomorrow. I ran the pump after replacing the lid and packing dirt around the pipe but it just came out of the box instead of going through the system. The downstream pipe is open. Can the seal be replaced around the incoming pipe or should the box be replaced? Do the other "boxes" typically have a lid like the first one does? I was wondering if I should dig them up and check for clogs. The system is 9 years old and is pumped every year. Thanks for any info and for this great website. Sure, if the D-box has become clogged by roots, and probably tipped and askew too, it needs to be cleaned, leveled, and the surrounding roots cut back to slow their re-invasion. Because you have just one pipe in and one pipe out of this D-box, and because you found a second deeper distribution box on your septic system, I suspect the first one is an access or inspection port and a connection between pipes, not much more. Ultimately, presuming there is more than one leach line at your drainfield, there will be a D-box that distributes effluent among multiple lines - you'll want to find and check the condition of that device. The T-pipes you describe make it sound as if the septic installer forgot what the D-box was for but just stuck one in anyway. Too bad. About the damaged seal on the first D-box, the choices are to replace the whole unit (this is not a costly part) or you could try cutting away the offending roots and digging around the pipe that enters or leaves the D-box, pouring concrete around the pipe at the outside of the D-box to try to get a decent seal. Continue reading at SEPTIC D-BOX COVERS or select a topic from closely-related articles below, or see our complete INDEX to RELATED ARTICLES below. 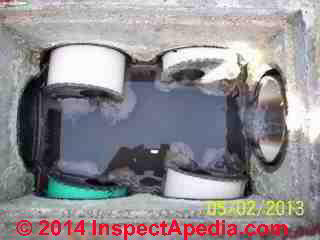 SEPTIC D-BOX FLOODING at InspectApedia.com - online encyclopedia of building & environmental inspection, testing, diagnosis, repair, & problem prevention advice.